Kristie (Capps) Gibson, EMgt’74, and John Gibson, EMgt’74, met in Thomas Jefferson Hall after a Miner basketball game. They both came to Rolla on scholarships, Kristie from Dexter, Mo., and John from Kansas City Kansas Community College, where he played basketball. They married during their senior year, graduated together and went to work as refinery engineers for Exxon Co. USA in Baytown, Texas. Over the next four decades, through many career moves, they remained connected to Missouri S&T. They were major donors to the Miner Dome dedicated in 2010 and the artificial turf installed on the stadium and intramural fields in 2014. 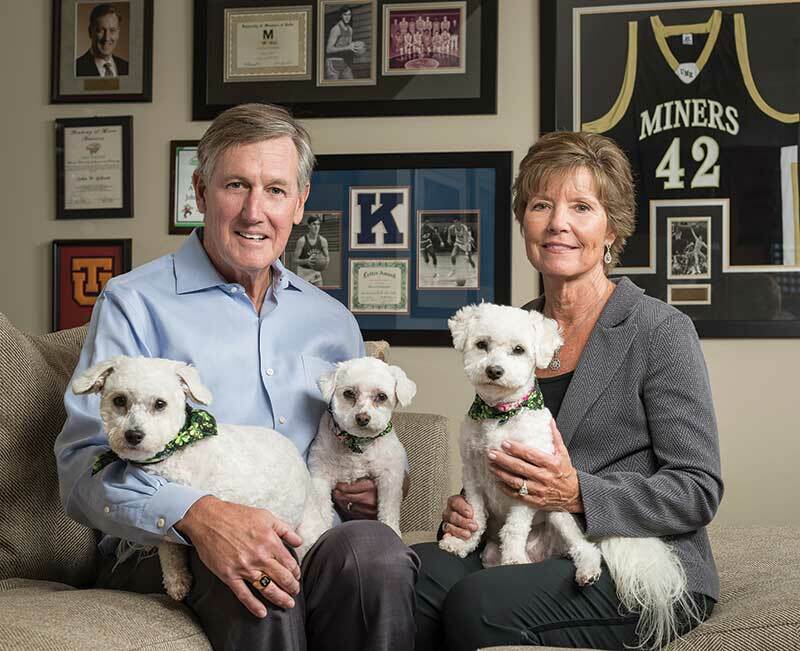 Now the Gibsons have made a $1 million gift in support of renovations to the arena where S&T’s men’s and women’s basketball teams and women’s volleyball team play. Renovations include new flooring, goal systems, a public address system and acoustics. “Basketball was an important part of my life,” says John, who received scholarship offers after playing community college basketball, but none from a university with engineering degrees. John spent 18 years with Phillips and was executive vice president of Koch Energy when he joined ONEOK, eventually becoming chairman, president and CEO of ONEOK and ONEOK Partners. He retired in 2014 and now serves as non-executive chairman of the $25 billion Fortune 500 company.